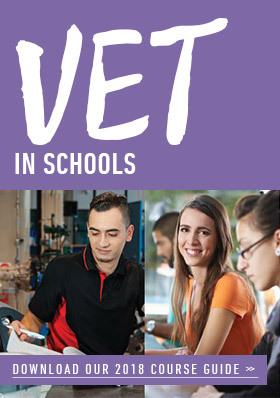 VET in Schools (VETiS) offers students the opportunity to complete a nationally-recognised qualification, while providing credit towards your VCE or VCAL. Many of our students chose to combine their secondary school studies with a VET qualification for a wide range of curriculum options and pathways to help them on their future career paths. You are guaranteed entry into an equivalent or higher certificate qualification at Bendigo TAFE. VET in Schools enables you to get real hands-on experience within a chosen industry, obtain a nationally recognised/accredited qualification and increase your career prospects by combining your secondary school studies with a Vocational Education and Training (VET) program. Prepare you for the workforce by providing hands on experience and getting you ‘job ready’. Provide a nationally-recognised qualification for a specific industry. Provide you with pathway opportunities and credit for higher level qualifications within the same vocational area. Provides the skills and ability to achieve competencies which will enhance your employment and further training prospects. Provides ‘work-ready’ knowledge and skills applicable to a variety of career paths in your chosen industry. All students who successfully complete an eligible VET in Schools course through Bendigo TAFE will be guaranteed a place in a pathway course – giving you piece of mind when it comes to your study choice after secondary school. Check out our VETiS Pathways here. How VET in Schools works? VET may contribute to the VCE at the Units 1 and 2 or Units 3 and 4 level. VET contributes to the VCAL through satisfying the requirements of the Industry Specific Skills or Work Related Skills strands. Each completed 90 hour block of VET equals one VCAL unit. Our VET in Schools program offers students two ways to undertake VET as part of the VCE or VCAL. VCE VET programs are put together by the Victorian Curriculum and Assessment Authority (VCAA) and provide credit towards the VCE or VCAL. Some of these VCE VET programs provide scored assessment for Units 3 and 4, which contributes to a student’s ATAR (see below for more information). The study score is calculated based on a set of coursework tasks and an examination set by VCAA. Students who undertake qualifications that are not approved VCAA VCE VET programs, may be eligible for credit towards their VCE through Block Credit Recognition. Credit is awarded in the VCE on the basis of achieving units of competency. Credit is determined by the AQF level and the nominal hours of competency. Where a scored Units 3 and 4 sequence is available it will contribute directly to the ATAR, either as one of the student’s primary four studies or as a fifth or sixth study. For unscored VCE VET programs, students who successfully complete a Units 3 and 4 sequences can receive an increment of 10% of the average of the primary four ATAR subject scores. VTAC may award students who receive a Units 3 and 4 sequences through Block Credit Recognition a 10% increment towards their ATAR. Applications for the VETIS 2019 program are now open. Contact the VET in Schools Co-ordinator at your school who will be able to help you decide which course is right for you and will be able to enrol you into the course. All VET in Schools programs offered through Bendigo TAFE incur fees for tuition and materials. Program costs vary for each program. Bendigo TAFE invoices the secondary college directly for all programs and any student fees payable are set by the individual secondary colleges. All costs are invoiced directly to schools four weeks after the commencement of the program. Bendigo TAFE will not directly invoice VET in Schools students or their parents.